You are here: Home / General / Putting the Pearl into our Steering! 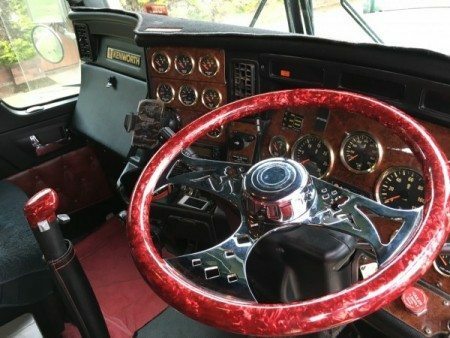 They say the world is your oyster and what better way to remind you daily, than to have your own PearlCraft steering wheel, dash, gearknob or the whole lot!! TSAA are excited to announce PearlCraft joining our Partners list and offering our ‘Truckies Club’ members a 10% discount along with a free Cap or T-shirt with every order! Continuing a 70 year old tradition that began in Australia just after WW2, PearlCraft take a lot of pride in playing a small but important part in their customers restoration projects or adding that special piece to their pride and joy! Circa 1940’s, the time honoured tradition of yesteryear continues today thanks to Pat and Sam who took the business over 4 years ago. Together they have vowed to continue the well guarded secret process and today they are the only pearlisers left in the world! The process requires your wheel to be sent to them and they we will transform it into something beautiful, with pearl and marble finishes being their speciality. They are not re-casters! All work is done as it was in a bygone era, totally and progressively by hand. Only hard surfaced wheels, ie bakelite plastic or wood, can be plasticised/encapsulated using their materials. Unfortunately soft or spongy wheels cannot plasticise. The process takes around 4 weeks to complete and come in any colour you choose. Yes they can also colour match as required too! All chrome/nickel work and polishing of alloy parts is outsourced. Pat and Sam also offer a special change over service for the trucking industry along with being able supplying smart wheels for any vehicle also. The product itself is very durable and, when looked after well, has been known to still be looking the goods 20 years later. The material used is about 1mm thicker than normal paint and approximately 6 clear coats completes the process giving them that amazing gloss look. Pat and Sam stand behind the product they produce so if there are any issues, customers just need to call and they can speak directly to the them. You can contact the PearlCraft team on 0457 766 096 or via their website: www.pearlcraft.com.au Don’t forget to sign up for your ‘Truckies Club” card so you can take advantage of that special Members Deal great deal. TTT Segment – Doug from Carrolls Springs Briskair – Continuing their support in 2018!